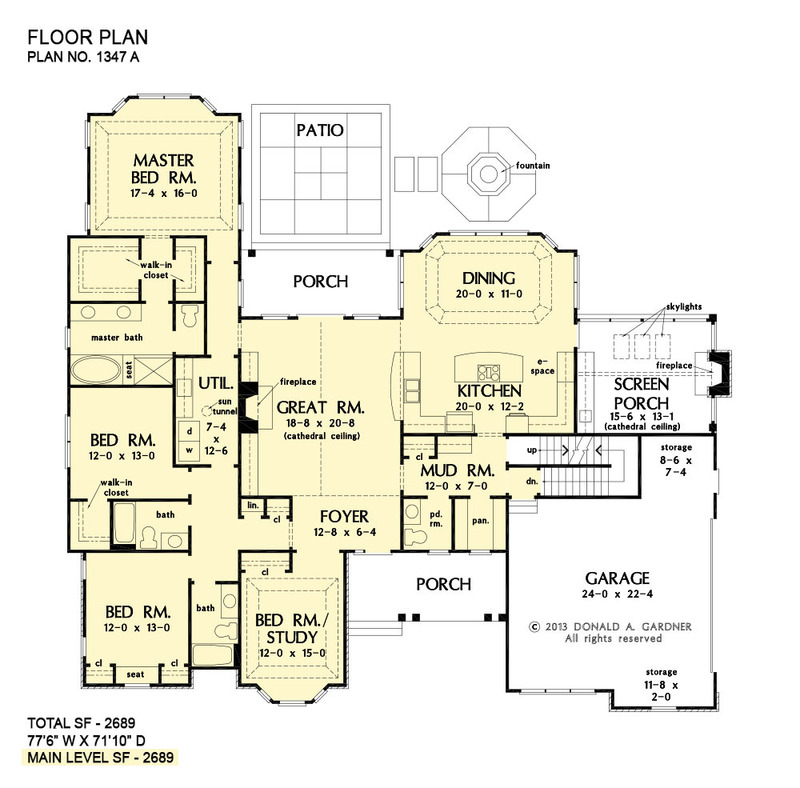 This European-influenced ranch design is family-friendly with attractive details that add warmth and character to the house plan. Bay windows and tray ceilings adorn the dining room, master bedroom, and bedroom/study, while a cathedral ceiling tops the great room and opens up to a rear wall of windows to bring in sunlight. A mud room, powder room, and walk-in pantry sit between the garage and the expansive kitchen, and a spacious laundry room is central to all the bedrooms for convenience. A bonus room offers flexible space in the house plan, and a cozy screen porch with fireplace is perfect for relaxing or entertaining. 1st Floor: 2689 Sq. Ft. 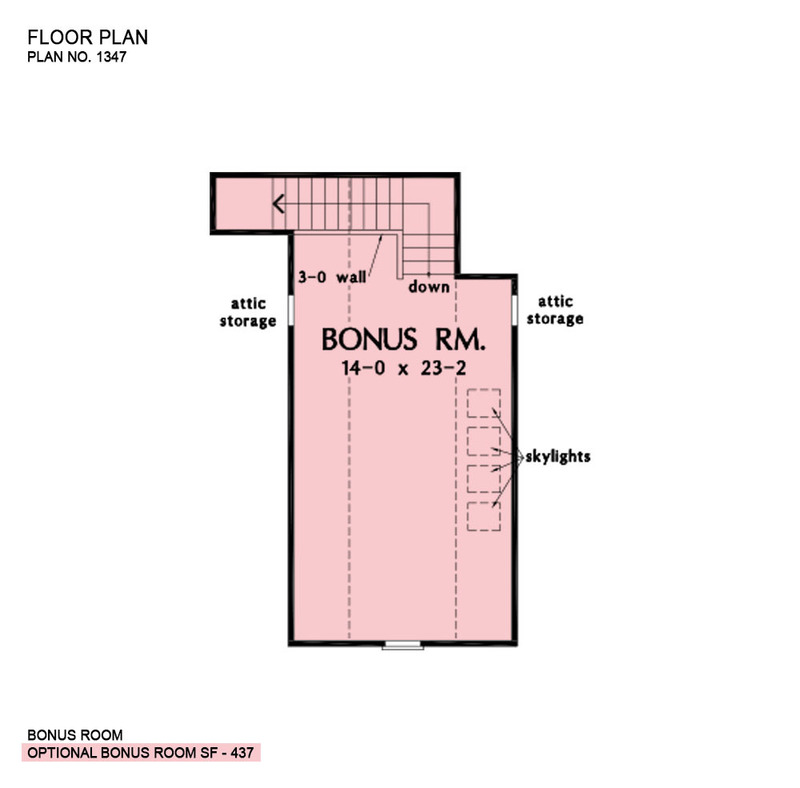 Bonus Room: 437 Sq. Ft.
Porch - Front: 149 Sq. Ft.
Porch - Rear: 146 Sq. Ft.
Porch - Screened: 235 Sq. 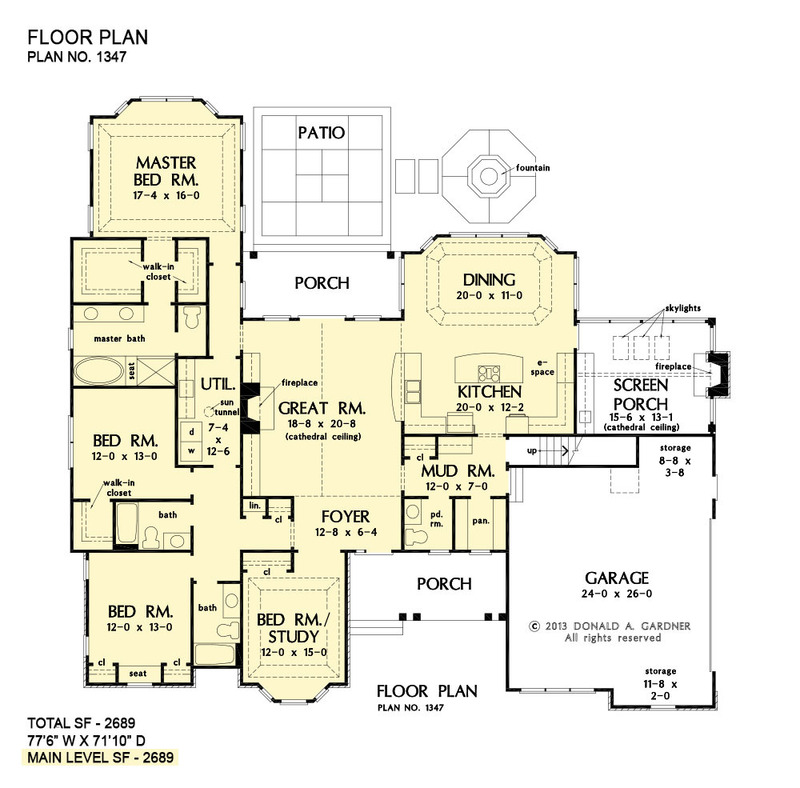 Ft.
House Dimensions: 77' 6" x 71' 10"
Great Room: 18' 8" x 20' 8"
Master Bedroom: 17' 4" x 16' 0"
Foyer (Flat): 12' 8" x 6' 4" x 9' 0"
Dining Room (Tray): 20' 0" x 11' 0" x 10' 6"
Great Room (Cathedral): 18' 8" x 20' 8" x 19' 8"
Kitchen (Flat): 20' 0" x 12' 2" x 9' 0"
Utility Room (Flat): 7' 4" x 12' 6" x 9' 0"
Bonus Room (Clipped): 14' 0" x 23' 2" x 9' 0"
Garage (Clipped): 24' 0" x 26' 0" x 0' 0"
Garage Storage (Flat): 8' 8" x 3' 8" x 0' 0"
Master Bedroom (Tray): 17' 4" x 16' 0" x 10' 6"
Bedroom / Study (Tray): 12' 0" x 15' 0" x 10' 6"
Bedroom #3 (Flat): 12' 0" x 13' 0" x 9' 0"
Bedroom #4 (Flat): 12' 0" x 13' 0" x 9' 0"
Porch - Front (Flat): 18' 8" x 8' 0" x 10' 7"
Porch - Rear (Flat): 18' 8" x 7' 10" x 9' 0"
Patio - Rear (None): 16' 2" x 17' 0" x 0' 0"
Porch - Screen (Cathedral): 15' 6" x 13' 1" x 16' 6"
Garage Storage Bay (Flat): 11' 8" x 2' 0" x 0' 0"
Mud Room (Flat): 12' 0" x 7' 0" x 9' 0"